Steve and Sally traveled to Quebec City and then took the train to the Maritime Provinces. 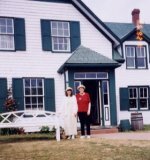 Laurie and Ann are huge “Anne of Green Gables” fans and visited Prince Edward Island and saw all the places made famous in the books by Lucy Maud Montgomery . Steve and Sally visited Newfoundland and also visited St. Pierre & MIquelon, France, an island off the coast of Newfoundland.